The museum’s new exhibition The Body Transformed, which will be on display until February 24, 2019, brings together 230 jewels, mainly from the MET’s collections, in one presentation. In other words, the treasure hunting has been done for you by a team of six curators spearheaded by Melanie Holcomb from the Medieval Art department. The main premise of the show is to highlight different ways jewels have been worn on the body from head to toe and to explain many of the various things jewelry has symbolized over time and across cultures. The show’s curators were motivated by two broad ranging questions: What is jewelry and why do we wear it? 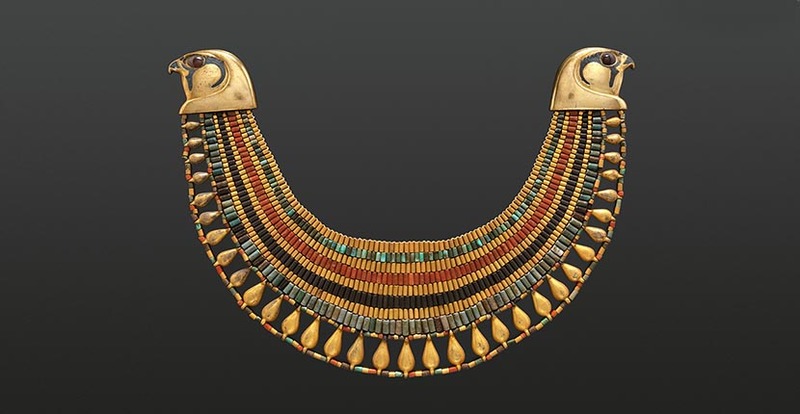 “Jewelry was the first art form, entering the archaeological record tens of thousands of years before cave paintings and sculpture figurines,” is the opening statement on the wall text of the exhibit. It sets a grand tone about the universality and eternality of jewels that is demonstrated in the first gallery. The Crown of the Andes is there. So are ancient Egyptian gold sandals and toe stalls and 16th century German steel lower leg armor. 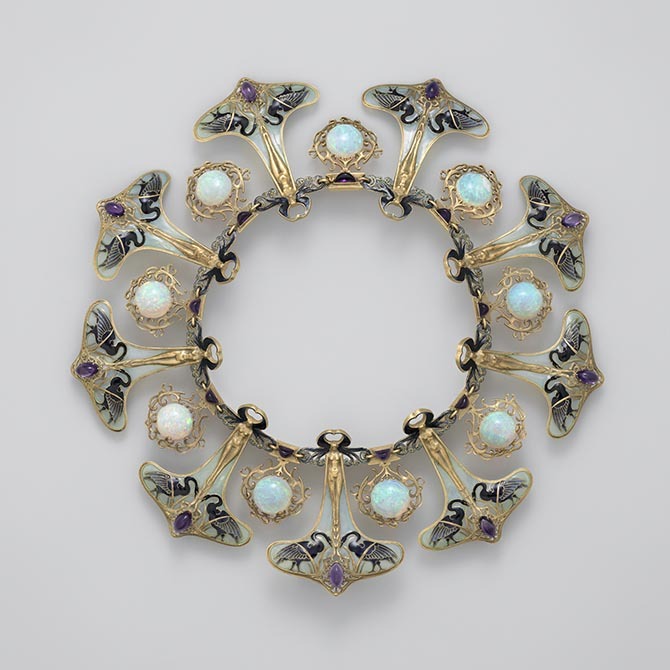 An Art Deco jade and onyx brooch by the innovative French designer Georges Fouquet is in the mix, along with an elegant diamond and natural pearl necklace made by the American jeweler Dreicer around 1905. There is also a badass ring titled Brass Knuckles created by contemporary metalsmith Myra Mimlitsch-Gray in 1993. After the eye-popping first room, the exhibit splinters more or less into sections that define the curators’ departments and shape into a smorgasbord of jewels, belts, objects, arms and armor. One half of the show is a traditional display of historical pieces. The Greek gold items are the most awe-inspiring in this part. 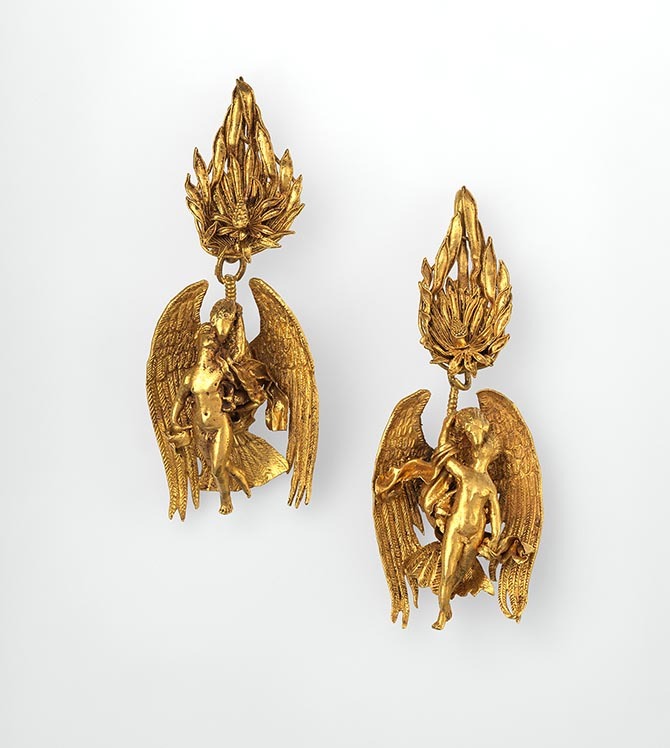 Earrings depicting Ganymede and the eagle created around 300 B.C. make you wonder what the jeweler’s complete collection looked like and marvel at how they must have been made. The gorgeous gold armbands from 200 B.C. with a Triton and Tritoness are so big, it feels as though they must have been fashioned for a man. The other half of the exhibit features a more contemporary blend of jewels manufactured over the last hundred years or so. The combination includes some great Art Nouveau jewels and Art Deco pieces. 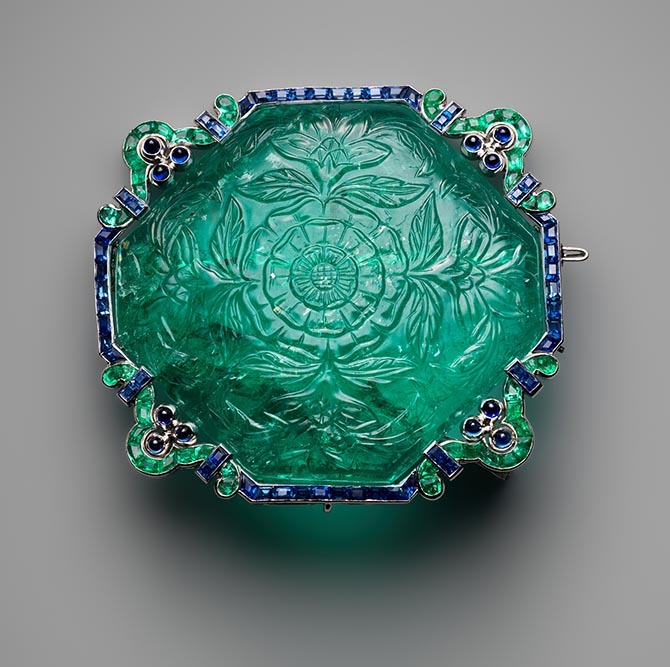 One of the most spectacular items in the show is the 17th century carved emerald set in an Art Deco brooch by Cartier. A brass masterwork made by Alexander Calder in 1940 is in this section alongside many other studio jewelers including Art Smith and Daniel Brush. Elsa Peretti’s great snake necklace and bone cuff are in an area that seems to be from the Costume Institute. There are several novelty items by Sean Leane, the designer who worked side-by-side with Alexander McQueen. In some ways the dizzying array of jewels in The Body Transformed feels as though the Metropolitan Museum of Art suddenly realized what those of us who are treasure hunters knew all along. They have great jewelry in the museum and no jewelry department. There is a sense of wonder about jewelry not only in the first statement that opens the show, but almost in the entire text of the catalogue for the exhibit. 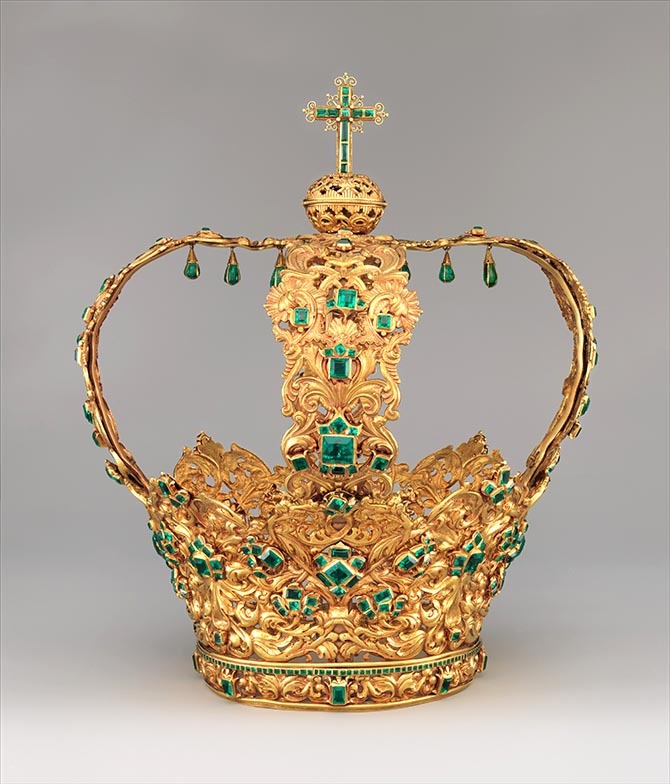 This intense interest in jewels from the MET has ignited a rumor that the museum might one day in the future form a jewelry department. I know I am not alone in my hope that this is not a bit of fake news. It would be wonderful for the museum to stage regular jewelry exhibits and delve more deeply into the many styles of jewelry on display in The Body Transformed. The MET Asks: What Is Jewelry?